The simple design of the Kershaw Bear Hunter II 1029 knife is sure to make it a favorite among outdoorsmen and hunters alike. 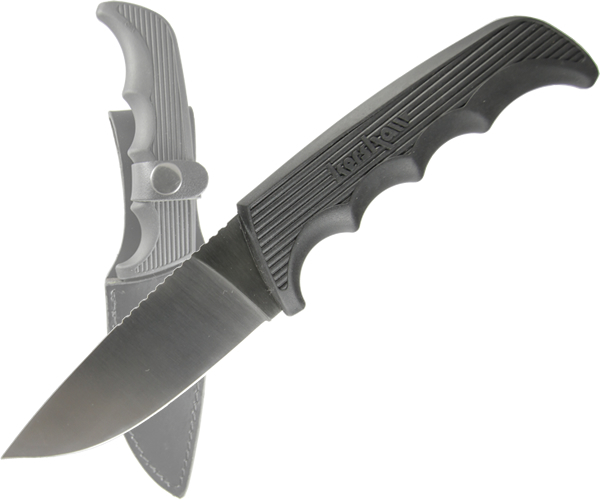 The fixed blade is constructed of 8Cr13MoV steel that resists wear and holds an edge longer than inferior metals. This means you get longer use in between blade maintenance. The handle is a co-polymer that has generous finger grooves and texturing to ensure a firm grip in all conditions. The spine of the blade is grooved for added stability while applying pressure for tough jobs. The Kershaw Bear Hunter II 1029 comes complete with a leather sheath to protect your blade and anything it may come into contact with while stored.